(Nanowerk News) Nanoparticles with sizes the order of a wavelength interact with light in specific ways. A young investigator group at Helmholtz-Zentrum Berlin, led by Professor Martina Schmid, is inquiring how to use arrangements of such nanoparticles to improve solar cells and other opto-electronic devices. Now the scientists report in ACS Nano ("Light coupling and trapping in ultra-thin Cu(In,Ga)Se2 solar cells using dielectric scattering patterns") a considerable success with ultrathin CIGSe solar cells. CIGSe solar cells have proven high efficiencies and are established thin film devices with active layers of a few micrometers thickness. But since Indium is a rare element, the active layer should be as thin as possible. This reduces the efficiency, since less light is absorbed. And if the active layer is thinner than one micrometer, an additional problem arises: more and more charge carriers meet and recombine at the back contact, getting "lost". "It took me more than one year to be able to produce ultrathin layers of only 0.46 micrometer or 460 nanometers which still reach reasonable efficiencies up to 11.1%," Guanchao Yin says about his PhD project. He then started to enquire how to implement nanoparticles between different layers of the solar cell. His supervisor Martina Schmid discussed this with Prof. Albert Polman, one of the pioneers in the field of nanophotonics, at the Center for Nanooptics, Amsterdam, with whom she was in contact for a while already. They proposed to produce arrays of dielectric nanoparticles by nanoimprinting technologies. In a first step, the colleagues in Amsterdam implemented a pattern of dielectric TiO2-nanoparticles on top of Yin's ultrathin solar cells; the idea was that they would act as light traps and increase absorption in the CIGSe layer. But this did not increase the efficiency as much as proved in Si-based solar cells. Yin then continued testing and ultimately found out what worked best: a nanoparticle array not on top but at the back contact of the cell! The colleagues from Amsterdam produced an array of SiO2 nanoparticles, directly on the Molybdenum substrate which corresponds to the back contact of the solar cell. 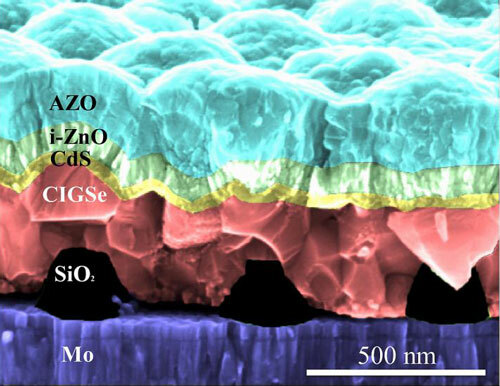 On top of this structured substrate the ultrathin CIGSe layer was grown by Yin, and subsequently all the other layers and contacts needed for the solar cell. With this configuration, the efficiency increased from 11.1% to 12.3%, and the short circuit current density of the ultrathin CIGSe cells increased by more than 2 mA/cm2. With additional anti-reflective nanoparticles at the front efficiencies raised even to 13.1%. "This leads to efficient light trapping and does not deteriorate the cell," Yin explains. Further studies indicate that the nanoarray of dielectric SiO2 nanoparticles at the back side could also increase efficiency by reducing chances for charge carrier recombination. "This work is just a start, we have now new ideas for further designs to enhance absorption and reduce recombination, thus increasing efficiencies by making use of optical and electrical benefits of the nanoparticles," Martina Schmid says.